What can the radio voice tell us about the representation of women in the media industry? I interview Toronto radio women on their lived experience of gendered voice in our Canadian radio soundscape. As a three-part radio thesis and audio documentary, “This is the Sound of my Voice” presents their experiences and voices, sonified. From Vocal Fry to uptalk, the discussion and critique of women’s voice in media is still one of notable debate. As a media producer and scholar, the role of the broadcast voice, that of other actors and of my own, entices a desire to explore this junction between soundwork and the self. This junction led me to focus on the gendered experience of the amplified voice for my Master’s thesis titled “The Gendered Experience of Voice in Radio and Beyond: Toronto, Canada”. 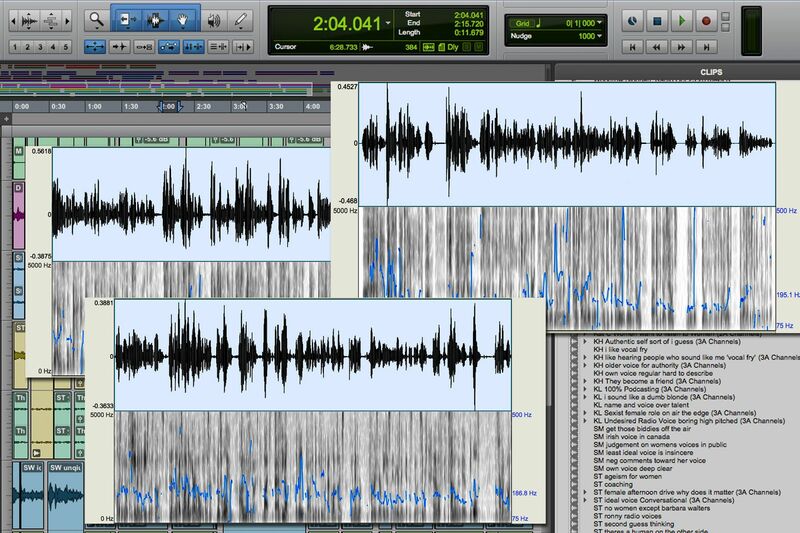 Centered on the experiences of individual women in Toronto’s broadcast soundscape, this work presents a feminist phenomenological approach to explore the intersection of voice as both material sound -an extension of the body and thus individual identities- and the weight of the women’s voice as politically and historically coded. This ear-oriented research through written word and now presented as a radio thesis asks: what does the material voice in conversation with perceptions and experiences of women identified people in radio and digital on-demand, say about the representation of women in the radio broadcast industry? and what do these observations come to represent or mean within the broader conversation surrounding diversity and gender equality in the Canadian media soundscape? “This is the Sound of My Voice” is now available for public/private broadcast. For inquiry and listening please contact Stacey Copeland via the contact page. Part 1 of 3 is currently in review for scholarly publication in 2018. Stacey Copeland “The Gendered Experience of Voice in Radio and Beyond: Toronto, Canada.” Master’s Thesis., (Ryerson University, 2017).